TOOLS evolved. TECHNIQUE did not. It never was a tool problem; it always was a technique problem. 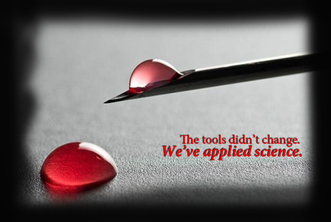 The tools used to access veins have evolved over time, but the technique has not. The healthcare industry's use of 19th Century technique keeps the whole process where it's at. Failure to access the vein (a recent study identified this as the #1 laboratory problem). Hemolysis, the result of poor technique. Healthcare Acquired Infections, the 8th leading cause of death in the United States. Vein access injuries - vein rupture upon venipuncture, IV infiltrations, bruising, and phlebitis. Laboratory specimens of poor quality and insufficient quantity. Delays in the delivery of diagnostics and therapies. Increased costs: supplies, personnel time, increased length of stays, and liability. It's time for the vein access procedure to advance into the 21st Century. Vein Access Technologies has taken that evolutionary step using evidence-based science to raise the standards of care in vein access. It's time for the new 21cVA technique - it works.